In our travels to both the East Coast and the West Coast everyone always asks the same question to us. Where to party in the Midwest? We always tell them the best two places to party in the Midwest is Chicago and Oklahoma City. Oklahoma City???? Yep, Oklahoma City is the major gay capital of the Midwest. Hard to believe? Well perhaps, however unless you have been there you certainly will not believe that in the bible belt of Oklahoma is this fabulous gay Mecca. 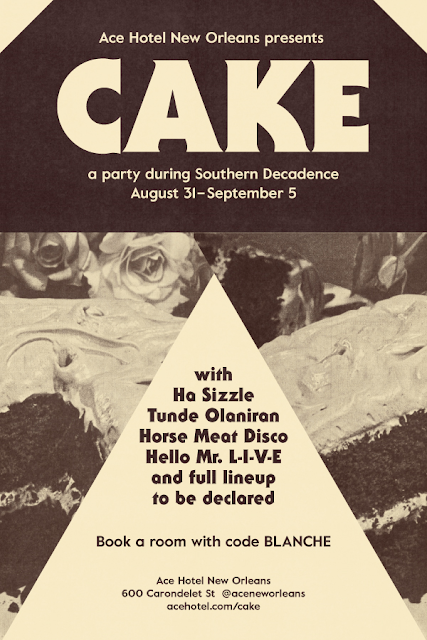 We have been going to Oklahoma City to party for over 25 years. The HABANA INN Resort there has been a gay resort for over 25 years. It is the Midwest's largest all gay resort. It is a two story complex. The rooms are spacious and extremely inexpensive. Their rates begin at just $44.95 per room. It is a totally gay resort. Lush tropical plants and trees surround the pool areas. Gays from all over the Midwest have been going there for years. And it is busy 7 days a week, not just on weekends. Lounge around the pool area and you are sure to meet that "someone special." No where in the Southwest will you find a place like the Habana Inn. With 170 hotel rooms, two swimming pools, two nightclubs, a restaurant, piano bar, and unique gift shop all conveniently located within the hotel complex, the Habana Inn is the place to be. Room rates are affordable and weekly and monthly rates are available for extended stays. 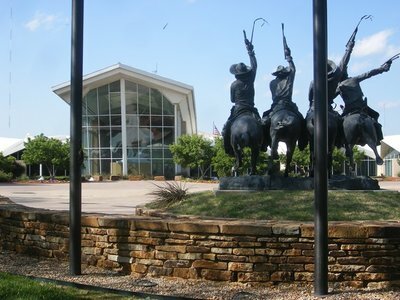 Leave your car parked for your entire stay as the complex is located in the heart of Oklahoma City's gay district. Six more clubs and several restaurants are within walking distance. Robert Nichols has been the General Manager for many years and in all of our travels we have found him to be one of the best general managers in the hotel/motel/resort business. He has done a tremendous job over the years for the gay and lesbian community. 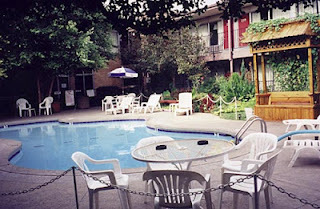 The Habana Inn offers two beautifully landscaped pools for your swimming and lounging pleasure. In fact, their pools have become the place to be during the summer. Both hotel guests and the locals can be found poolside enjoying the Oklahoma sun and the highly charged Habana Inn atmosphere. . Through out the summer their pools are the site of many sponsored events but the highlight of those is the Sunday afternoon Pool Party hosted by the Finishline. This weekly gathering includes a beer bust, cookout and of course tons of cute guys. 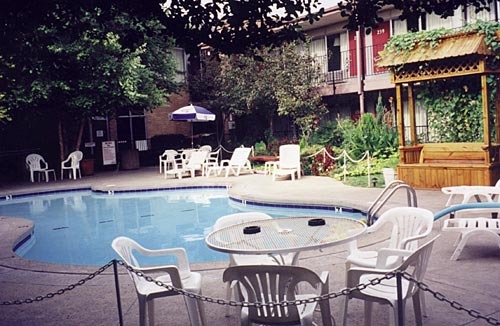 The Habana Inn offers two beautifully landscaped pools for your swimming and lounging pleasure. In fact, their pools have become the place to be during the summer. 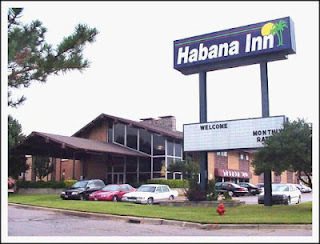 Both hotel guests and the locals can be found poolside enjoying the Oklahoma sun and the highly charged Habana Inn atmosphere. If its Pool Parties you like they have got that too. Throughout the summer their pools are the site of many sponsored events but the highlight of those is the Sunday afternoon Pool Party hosted by the Finishline. This weekly gathering includes a beer bust, cookout and of course tons of cute guys. Within the resort complex they have a wonderful restaurant "Gushers" which has a great ambiance and serves delicious food. Prices are inexpensive. And all entrees comes with potato, salad and bread. The restaurant overlooks one of the pool areas so you can enjoy the boys frolicking in the pool as you are dining. They also offer sandwiches, soups, salads, pastas and appetizers. And a breakfast menu is available on weekends. There are three bars in the Habana Inn complex which are completely different. COPA's is a dance, disco and drag bar. Weekly they have strip shows, drag shows and comedy shows. FINISH LINE is a country/western bar with plenty of country dancing. This is the place to see the real cowboys in action. THE LEDO is a quiet piano bar. All of the bartenders are super friendly and they all know how to make out of towners feel right at home. The owner of the bars and restaurant is to be commended for his outstanding job of always having "theme" nights and specials. The nights we were there, Long neck bottle beer was two for one. When so many bar owners just sit back and wait for customers to come in, this owner attracts customers by having specials, etc. Why can't all bar owners do things like this. Also in the resort is JUNGLE RED, an adult gift shop with magazines, videos, cards, gifts, leather, pride items plus a lot of decorative items for the home.